In my opinion, your new DSC marine radio may be a can of worms. In many DSC radios, the DSC signals will interrupt voice operation of the radio. These signals can’t be heard, but if there are a lot of them, they can make the DSC radio unusable for voice communications. In cases of critical construction or ship docking, captains should not activate the DSC function of their radios. A radio technician can check your DSC radio with an RF signal generator. The DSC functions are enabled in the radio by installing the MMSI number. Put your radio on an active weather channel, and then have the radio tech generate an RF signal on 156.525 MHz. If this signal turns off your weather channel reception, you have a problem DSC radio. This radio can be disabled at any time by DSC activity or other signals without your knowing it. I have quite a few concerns about this serious sounding warning, which of course is now percolating around the Web. 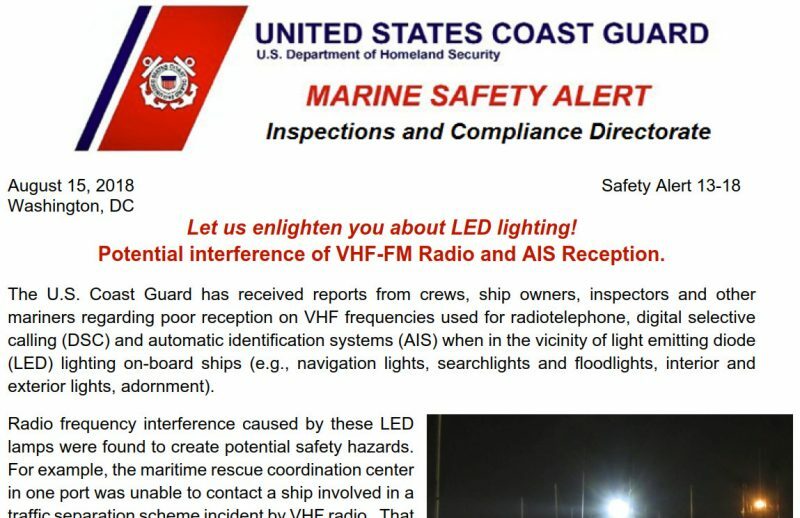 Like why use a signal generator to test the radios—they’re certainly not common on the water, they don’t actually duplicate DSC transmissions, and the Coast Guard will have be on your tail in a hurry if you ever fired one up at a high wattage. Instead, if there really is a problem, it should appear if you use DSC anywhere near the “faulty” radio. I did just that yesterday with three fixed VHF’s, including one model that Ositis had specifically named as an offender, and could not get a DSC call from one to another to even cause a click on the weather channel playing on the third, no matter what combination of radios I used. Moreover, if there really is a problem, Ositis’s recommendation that boaters should not activate DSC by entering an MMSI is a crude fix indeed. Many sets, like the Cobra above, can be set to ignore digital channel 70 (156.525 MHz) while still being able to send out an automated distress signal if you’ve programmed in your MMSI. In fact, Ositis’s advice is in direct contradiction to the Coast Guard and many other safety minded organizations who are working hard to get boaters to use DSC. Meanwhile he claims to have shown the problem to the C.G. and FCC, and that they are changing the specs on U.S. DSC radios, making many existing ones obsolete. I’ve heard for years that the FCC was going to upgrade the minimum spec to full Class D but I never heard that the existing SC-101 spec had serious problems and would become obsolete. And I won’t believe it’s true until I hear it from someone more convincing than Mr. Ositis. By the way, Ositis Communications is not a marine radio company but rather seems to be involved in renting tower space. End rant; more on the Cobra tomorrow.